When Personalization Engine detects a new URL on your site that it has not seen before, it will automatically spider that URL. The spider does not “crawl” through pages automatically following links. It will hit new URLs once. 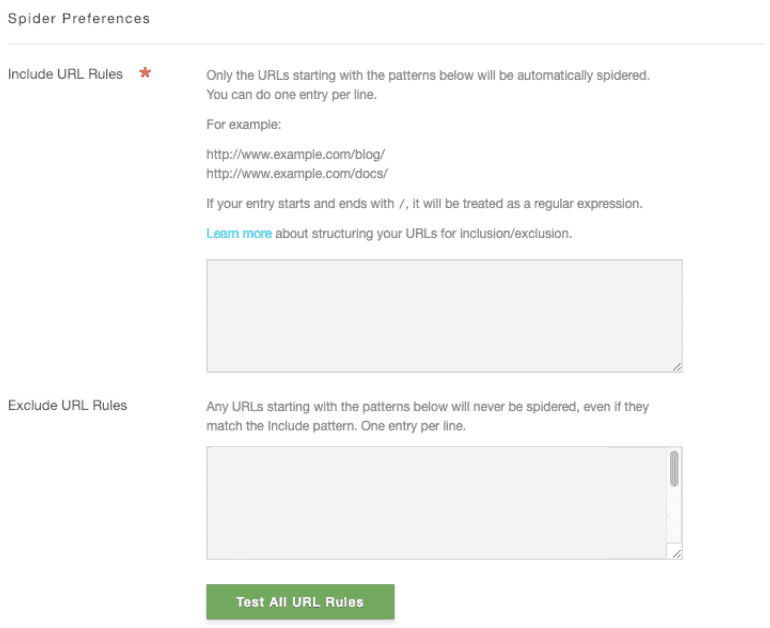 You can designate which URL structures the spider hits with include and exclude rules. Be careful with the syntax for Include URLs, especially ending in /. For example /http:\/\/www\.mydomain\.com\/[0-9-]\// would expect only ONE digit (or -) followed immediately by a /. So if your URL was http://www.mydomain.com/2013/0501/article.com then it would not be included in spidering. If certain URLs have a query string, go to our Spider Preferences page to add certain query parameters in the “Spiderable Query Params” section. For example: if you have the URL: https://www.example.com?id=1&content=test&extra=foo you’ll want to include “id”, “content” and “extra” each on their own line within the “Spiderable Query Params” section. Only add the query parameters that you want to be pulled into Sailthru. If you need to exclude certain parameters, leave them off! Using the Recommendation Settings Page, you can instruct the spider to include/exclude specific content. Enter a specific URL or URL structure on each new line to instruct the spider what is okay to use and what is not. Pageviews are still incremented and tags are still added to the user profile and to the Personalization Engine domain. Exclude rules only affect whether the page is spidered or not. Simply paste the base literal URL into the Exclude field. Otherwise, see Creating Expressions below. URLs that are longer than 512 characters will be automatically excluded. When excluding URLs, starting and ending a line with / instructs the spider to treat the URL as a “regular expression” or “regex” for short. This means the spider will attempt to match the structure of the URL instead of taking it literally. Say you wanted to exclude the following URL type from spidering (an example WordPress page URL). There are four [0-9] for the year and two for the month. Note, we’ve left off the DAY’s [0-9] because we know anything with the subdirectory /page/ should be excluded, thus making the DAY excessively specific. We’re almost done, but first we need to apply a little more detail so the spider fully understands its instructions. The next and final steps require a small bit of programming knowledge that we’ll explain below. 1. To create a non-literal URL expression, you’ll need to reference the chart below to set character ranges. See the Regular Expression Syntax Guide. 2. Next, we’ll wrap the entire line with two characters, telling the spider we’ve created an expression and to not take the URL literally. 3. Last, we need to make sure the spider isn’t confused by the other / and .characters inherently part of the URL. To do this, we’ll perform an escape on those other / and . characters. In programming, an escape is performed by using a \ before the character we do not want confused. Note, this is the backslash, not the forward slash used in URLs. This creates a pattern where each // and .. are preceded by a \, in turn looking like \/\/ or \. Note: We do not do this for the / we added at the start and end of the line in the earlier step. Adding that URL to the Excludes in the Recommendation Settings Page will exclude all URLs structured like http://www.mywebsite.com/2011/09/page/8. For further examples and explanations, we suggest visiting Mozilla’s Developer Network regex page. For easier comprehension, the following examples do not include the above syntax. Note that escapes for.and /must be used when including and excluding regex URLs. Example: If you want to include only WordPress posts in your Concierge feed, you could use the following expressions in the Allow/Exclude areas of the Recommendation Settings Page. Please note, these expressions are based on a WordPress’ Permalink structure. Use of custom structures may require modification of these examples. Exclude your homepage, but include all other URLs that start with that base URL. To see the data that is being collected on your website, click to the Content tab > Spidered Content. You will see content listed under the following headers. 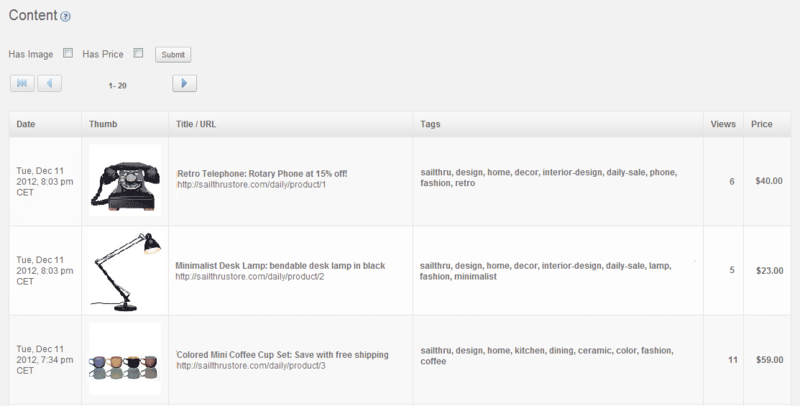 See Personalization Engine Meta Tags for examples of how to set up these tags on your site. Sailthru’s Support Team can assist you in limiting your spidered content if you’re still uncertain what to do. Please contact Support with examples of URLs you’d like to include AND exclude so they can best assist you.